Filed to: What's in the box?Filed to: What's in the box? What makes it deserve all that praise? 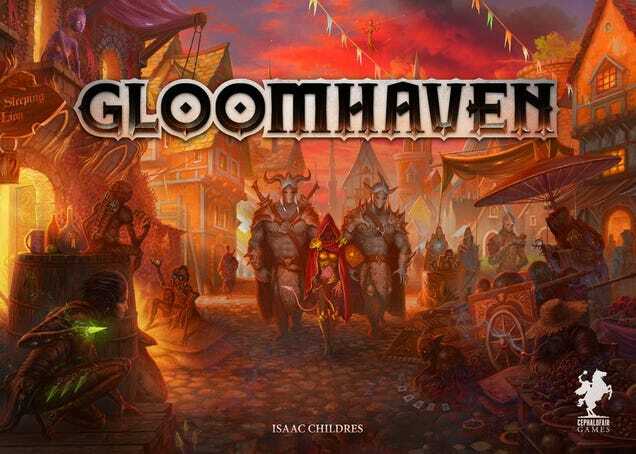 What is the part I hope affects future game design to the point where it is a cliché to say that a game is “like Gloomhaven?” It is the main part of the game; it is the way you make choices in combat. If you want to read an even better blog about it, you can read this (but then come back). “A selection of level 1 Tinkerer ability cards.” No spoilers. Each player has a hand of cards at the beginning of a scenario. (Each scenario comprises of about 3-6 small rooms, occupied by a dozen enemies, some obstacles and traps, and maybe a treasure or two...or another trap.) This hand of cards has all your actions throughout the scenario, with multiple characters to choose from to determine what cards you have. The particular greatness about Gloomhaven is that each card has a top and bottom action, and when you play your turn, you use two cards. One card is used to play a top action (usually attack related,) and one is used to play a bottom action (usually movement related). Each card has a different top and bottom action and can also always be used as a basic attack or movement instead. This creates an incredible number of possible combos and dramatic choices on nearly every turn. Gloomhaven also gets it right with other incredibly well-balanced turn mechanics. When you pick your two cards at the beginning of a round, you are not committing to which top and which bottom you will use. You do that when your turn comes up. (Turn order is based on an “initiative” value given on the cards picked.) Most played actions are sent to a “discard” pile you can refresh from on turns you choose to rest. Other better actions are sent to a “lost” pile once used, gone until the end of the scenario. When you refresh your hand from your discard pile, you must “lose” one as well. This means the number of cards remaining tells you roughly how long until you are exhausted and unable to play anymore until the scenario ends. This all makes for a great strategic co-op experience. It is a game that you do not want to approach saying, “How fast can we finish playing?” It should be something you will lament the inevitable conclusion of. This is what a hand of cards looks like. Oh, you already knew that. Back to the crux of the whole system, playing your turn by picking two cards and picking one action from each card is something I want to see other places. It might not sound like the most definitive modern game mechanic, but it is just that good. I imagine this could be used for so much more. Even I can come up with Gloomstation, the space adventure in space. I am sure far more creative people can come up with far more creative things than that, taking it into whole new genres of games, maybe somehow even video games.